Born out of my personal understanding that change requires, commitment, perseverance and willpower, as well as a supportive environment that fosters and celebrates such shift, I began toying with the idea of creating a way for people to commit to lifestyle changes. I began by observing different types of people and age groups to help me understand their habits. Good habits and bad habits, and the repercussions of such choices. My main assumption was that people need support to create long lasting good habits change. Particularly, I wanted to investigate the connection between individuals and how other people in their life influenced them and helped foster similar behaviour. In order to do that, observing partners together was essential. 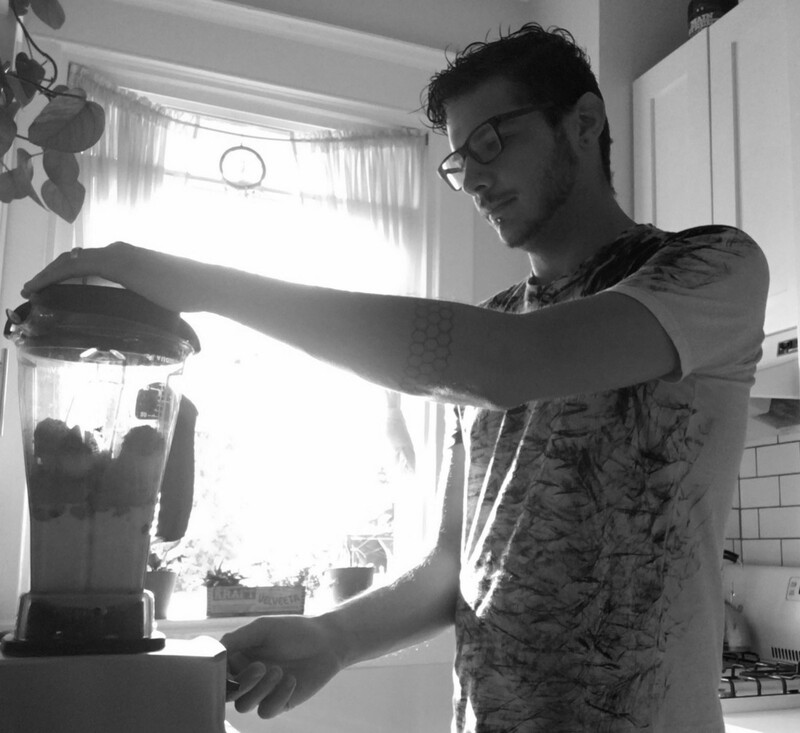 Research: I observed morning rituals in my participants. Mainly I focused on workout practices, fitness goals, education goals and eating habits. I spent a few nights with older couples, and with friends so that I could observed their practices. I joined couples during meals at different places and times. And inquired about their life goals, desires, and needs for support from their partners in achieving this goals. A way to receive coaching when setting new goal and making better choices. Personal commitment and a way to keep them accountable to their resolutions. Encouragement, and motivation to keep them engaged on their path. 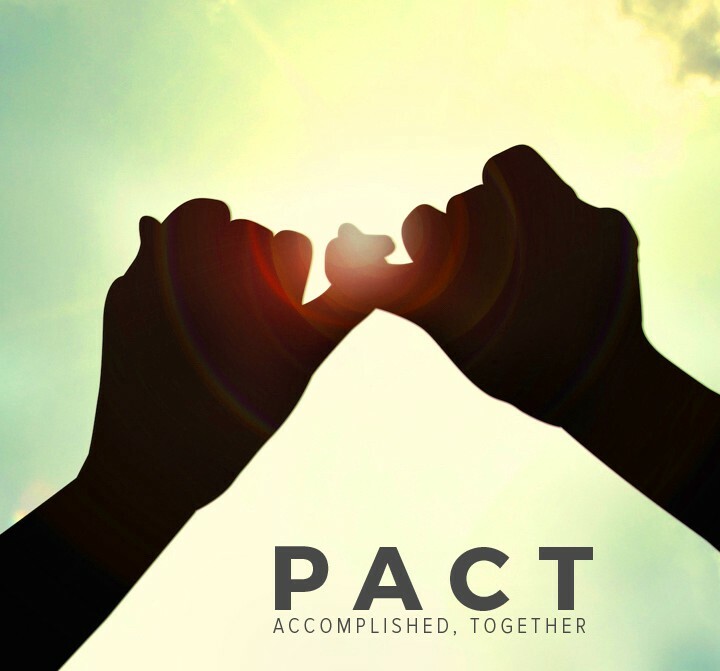 PACT addresses this needs by giving users access to a network of friends and professionals in a social stream. A place where users can declare their goals and other people can partner, mentor and cheer them on their journey, while users can track their progress and feel motivated to continue on their journey. Be accountable for your set goals. 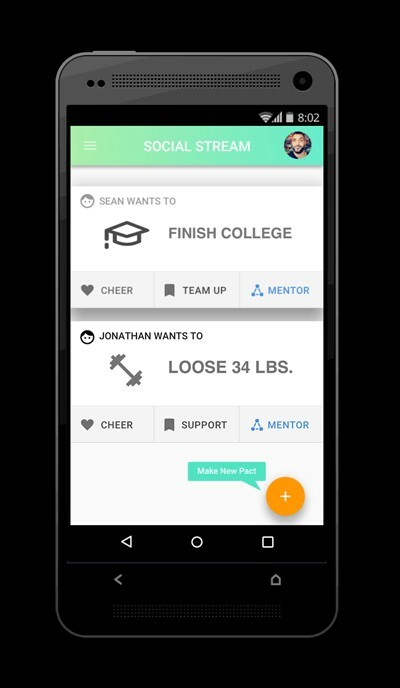 Partner up, receive mentoring, and be cheered by your peers, while tracking your journey to success. The idea of pact came about gradually. The initial idea of having a goal setting stream came from studying the instagram hook loop, where posting content generates likes, and make people want to generate and post more content. Other elements came from studying other apps in the fitness sector, like calorie tracking ‘MyFitnessPal’ as it was the case of the progress tracking stream. 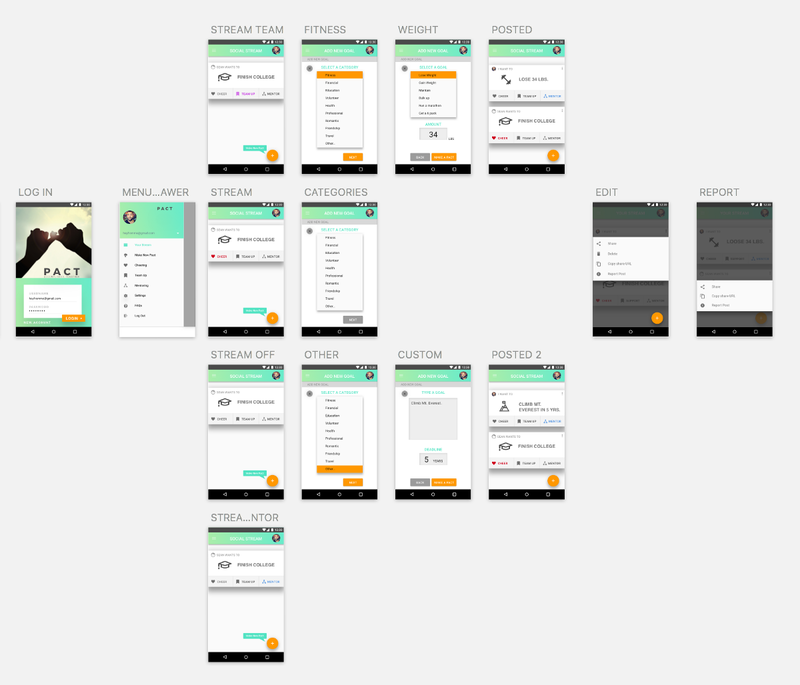 The interaction flow was distilled over 4 iterative prototypes, all received a round of testing by users, and the final one was A/B tested against an alternative version. The users informed about particular challenges, disconnects and their feedback sparked some of the major edits from version to version, like colors, copy clarification and CTA’s. 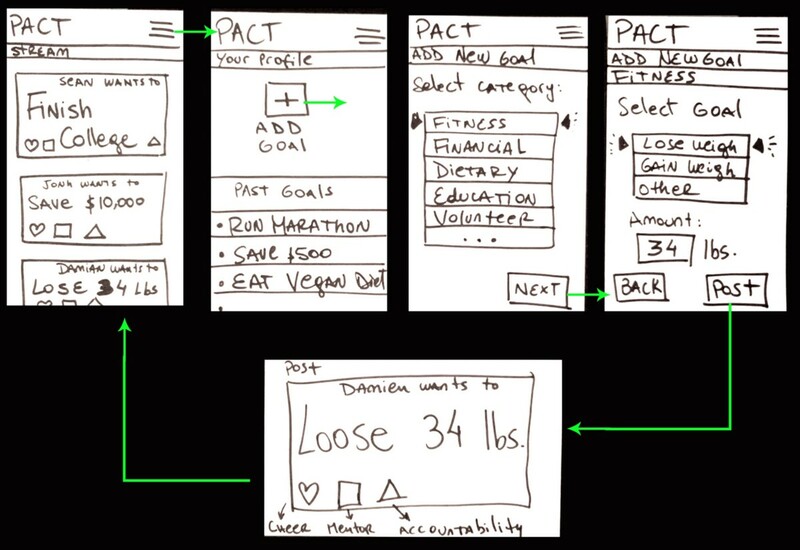 PACT interface is very straightforward. After logging in, the user is taken to their social stream. Here they can see pacts made by their social network, as well as inspiring progress posts, inspirational posts, and “how to’s” posts. From this screen, the flow is simple, following the Material Design guidelines, a new post can be added from the floating rounded CTA with the ‘+’ on the bottom right corner of the screen. The user is given an opportunity to select a category for the new PACT, as well as creating a custom one. After that the flow tree diverges into the corresponding branch until the ‘Make a Pact’ CTA is reached and the user is returned to the social stream. User can interact with the posts in 3 distinct manners. With ‘Cheer’ users can simply encourage and agree with a pact post. With ‘Team Up’ users can join on the PACT and make a similar one themselves, with ‘Mentor’, expert users can offer advice and help someone on their journey to success. Even in its current prototype version I wanted the app to feel simple, direct to the point and unclutter. I wanted a flow pattern that was easily recognizable, just like posting a photo on Instagram, or adding a new story to Snapchat. The processes didn’t need to be too complicated. That said, it is a very social app, and the way people interact with the content, and the social stream is where most of the interactions would happen.